As you drive the main drag of Tofino, a coastal resort town on Vancouver Island, competing signs beckon you to go whale-watching. The competition among tour operators is genuine on the street and in the fliers hawking tourist attractions and activities. Each business wants to attract the most tourists to its boats. But out on the waters, the captains turn from competitors to collaborators. They share their whale sightings by radio, and the competing boats race to the area and follow the same whale(s) for a while, their boats bobbing on the water and their passengers pointing and exclaiming each time a great beast surfaces. On Wednesday’s cruise, our Ocean Outfitters pilot told us orca sightings were rare. 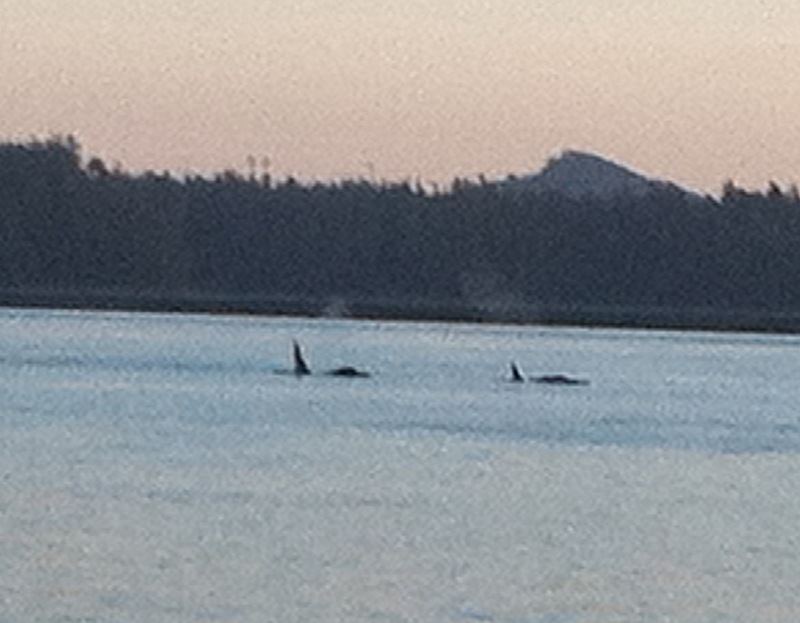 We rushed to leave early because orcas had been spotted in the morning. But the word came quickly as we left that they had moved out of range. We were still happy because we saw two gray whales on the way out to the hot springs. A boat from Jamie’s Whaling Station had spotted the grays and alerted our pilot. After a couple hours at the hot springs, we quickly spotted a pair of humpbacks in the open ocean. Our pilot was quickly on the radio spreading the word. But then he heard that some orcas were back in Clayoquot Sound near Tofino. He revved up the motor and we bounced across four-meter swells for more than half an hour, barely slowing down for a brief spotting of a gray whale. As we entered Clayoquot Sound, it was easy to see where the orcas were, even though they were submerged at the time. Four boats bobbed on the water, waiting for them to reappear. A pair of the black-and-white killer whales gave us a wonderful show, their huge dorsal fins rising from the water several times as they exhaled great clouds of mist. I share this as a non-media illustration of a point I have made in two recent blog posts, that media companies should explore possibilities of collaboration with their competitors. Each situation is unique and cooperation might not work for your market. But consider whether you help yourself by letting your competitors know when you spot a whale. Tofino’s tour operators can and should compete like crazy to get you on their particular boat. But then it’s time to cooperate and make sure everyone leaves with happy memories and tells their family and friends about the whales they saw in Tofino. It is in nature for men to complete, but I do agree there will be more benefits in collaboration.